Another “coincidence”: both the Yuma and the Sumerians have it that the son of the Creator wants to destroy its creature, same as Enlil (one of the sons of Anu) who attempted to destroy the men he had created. It is appropriate here to anticipate that we will present our interpretation of Zecharia Sitchin’s studies with regards to the “Eagle”, an animal always present into the Mesopotamian documents. 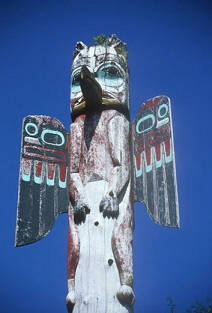 The eagle is considered to be a sacred animal for many people, especially for the North American Indian nations. In his “The Twelfth Planet”, Sitchin reports how Etana, thirteenth king of Kish, was appointed by the gods to bring “safety and prosperity” to mankind. Etana however could not bear a son who would have ensured the survival of the bloodline. The only way was the Plant of Birth which was not on the Earth, but in the heavens. "...But instead of speaking of a Shem, Shamash told Etana that an "eagle" would take him to the desired heavenly place...Arriving at the mountain indicated to him by Shamash, "Etana saw the pit," and, inside it, "there the Eagle was....The first two attempts failed, but on the third one the Eagle was properly raised. At daybreak, the Eagle announced to Etana: "My friend ... up to the Heaven of Anu I will bear thee!" Instructing him how to hold on, the Eagle took off - and they were aloft, rising fast..."
"...We cannot help associating the ancient text with the message beamed to Earth in July 1969 by Neil Armstrong, commander of the Apollo 11 spacecraft: "Houston! Tranquility Base here. The Eagle has landed!"..." He was reporting the first landing by Man on the Moon. "Tranquility Base" was the site of the landing; Eagle was the name of the lunar module that separated from the spacecraft and took the two astronauts inside it to the Moon (and then back to their mother craft). When the lunar module first separated to start its own flight in Moon orbit, the astronauts told Mission Control in Houston: "The Eagle has wings." But "Eagle" could also denote the astronauts who manned the spacecraft. On the Apollo 11 mission, "Eagle" was also the symbol of the astronauts themselves, worn as an emblem on their suits. Just as in the Etana tale, they, too, were "Eagles" who could fly, speak, and communicate..."
How shall we interpret, then, the second part of the Yuma's Legend of the Creation? It seems clear that the Native Americans, as well as the people of Mesopotamia, were 'visited' and 'instructed' by gods, that is, evolved beings who were capable of guide them and be worshiped. When the 'eagles' arrived the son of the Creator "...dwelt no longer among the Yuma...", and yet they continued to feel his presence. How? "...in their dreams...", which perhaps meant telepathy. We find the description of the four eagles, as related by Komashtam'ho, quite interesting; each of them had a different color, and came from different direction. Were they made of four different materials? And the fourth eagle, the "unseen", could have been something technologically superior, invisible or incredibly fast? There are no doubts here that the Yuma legend is describing spacecrafts, which the gods used apparently for their travels. The fact that the 'four eagles' came from the four cardinal points suggests that, at the time of the legend, the whole of the Earth was inhabited by these "gods". All these passages tell about a world completely covered with water; in the first myth, however, we have a very important indication about the existence of an "underworld" were living creatures could thrive. Then, perhaps, such authors as Bulwer-Lytton, Rene' Guenon, Jules Verne and others were not just visionaries, when they put forward the theory of the Hollow Earth. The waters covered everything, then "four storms" pushed them away, like some sort of Antediluvian unknown technology. In the Crow's myth man is created out of mud. The same metaphor is used in almost every legend of creation around the globe (including the Old Testament), but here the Creator meets with a creature he didn't create. Old Man Coyote is surprised, and obviously the creature is not able to shed any light upon his existence. What this tells us is that there was not only one Creator, but more than one, which, according to the tale, didn't know one another. The third passage decribes part of a Sioux Brule’ ‘s legend. Theirs and the Yuma’s lore converge in the first part, where the creator(s) attempts to destroy Mankind. This concept can also be linked to the story of Enlil as narrated by the Sumerians. In the second part of the Native American’s legends it is said that “Eagles” saved some humans from total annihilation (in the form of a beautiful girl who, mating with her savior, generated a new offspring. It is a simple and direct sentence, which doesn’t need to be attached any metaphysical meaning. In the first paragraph, line 1, we read a description of the first places of the creation, in the East, which from the Native Americans’ perspective would be the Eurasian land mass. According to Sitchin the first landings occurred in the Tigris and Euphrates basin, in the Orient, due East from the Americas. "...Several representations of ‘Eagles’ have been found...placed near the Tree of Life, to tell us that they are the link with the Heavenly Abode where the Bread of Life and the Water of Life are kept. In such representations...the Eagles hold the Fruit of Life in one hand, and the Water of Life in the other..."
Likewise, in the legend of the Snohomish, the ‘trees’ contained the knowledge, and allowed “access into the Heavenly World” without any help (this in fact was ‘forbidden’ to them). At some point, however, something happened which, by the will of men, caused a fracture between the two ‘worlds’, and the heavenly one was pushed away. Maybe a rebellion dictated by fear? Of course it is difficult to give a plausible explanation, but the links between two people so diverse and so far away in space cannot be ignored, or worse, labelled as another “coincidence”. 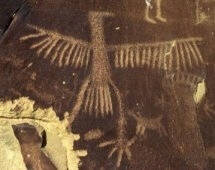 In the Acoma’s legend the birth of man (two females) happened underground. We may have a reference to genetic experiments which are said to occur in subterranean laboratories in many parts of the world still today. The more so, at the dawn of the Earth, when its surface was covered by water and not suitable for life, it’s only logical that visitors from outer space chose the myriads of underground caves and natural tunnels present on this planet as base for their operations. 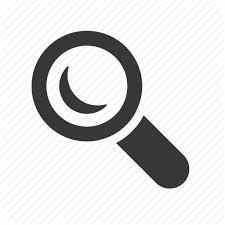 Still today, under the American soil, there is evidence of the existence of secret bases going deep down into the crust for miles (The Nevada Test Site complex, for instance, or the Dulce Base in New Mexico, or the Los Alamos Laboratories). How old these caves really are? Were they equipped for genetic experimentation since the time of the ‘gods’? And what are they used for, today? If we consider that the two females were already alive underground (where the Sun doesn’t shine), the answer can only be that they were asked to revere a planet, the indirect “Father” responsible for their creation. Therefore, when the two females ask Tsitctinako where their father was, he doesn’t say “it’s the Sun”, providing instead precise coordinates:“four skies above”. If by “skies” he intended planets, constellations, galaxies, or dimensions, we cannot say. What is crystal clear, to us, is that the “father” was not the Sun. In the Cherokee legend is told about the existence of living beings with "their home...up there, above the rainbow...", that is, far off the terrestrial soil, and that "...it was crowded...", which could account for one of the reasons for these beings having visited earth in the first place, with the intention to colonize a new vital space and solve the overpopulation problems in their planet of origin. In the same token the legend speaks of a 'subterranean world' accessible only if "...underworld people...be your scouts and guide you..." (the Jicarilla people have the same legend). The 'heavenly visitors' knew, we believe, the existence of this world, but for some reason they decided (or were forced) to wait that the waters withdrew in part (they may even have helped this natural cycle by utilizing their advanced technology to 'dry out' some coastal areas), and then they settled the first colonies. The legend of the tribes of California tells us about two antediluvian creators, who were forced to fall back because of a great catastrophe whose magnitude destroyed "the gods' creation"; but then, in the middle of the earth, they managed to erect a solid surface where to remain. The reference of the East as the middle of the world coincides with Sitchin's theories, which hold that the first landing of the Nephilims, and thus their first colony, was in Asia Minor (Mesopotamia region). The Osage believe to be the direct offspring of like men who lived 'in the sky'. These men were ordered to go down to earth, but they found it covered with waters. "...The people could not return to the place they had left..." could mean that they had the coordinates to arrive to this planet, but didn't have the ones to go back to theirs; perhaps they were exiled, or their planet's orbit had gone too far by the time they wanted to return. "...They floated about in the air..." with their spacecrafts "...seeking in every direction for...some god...", looking for some of their companions who might have followed the same route. The Osage mythology offers a new perspective about the creation: it would seem that "the gods" not only created the man above and below the earth's surface, but that the same experiments were made successfully on their planet of origin, so that for a time creators and creatures lived there together. Later on, perhaps due to an overpopulation problem, the creatures were sent down to earth, followed by some of the creators. 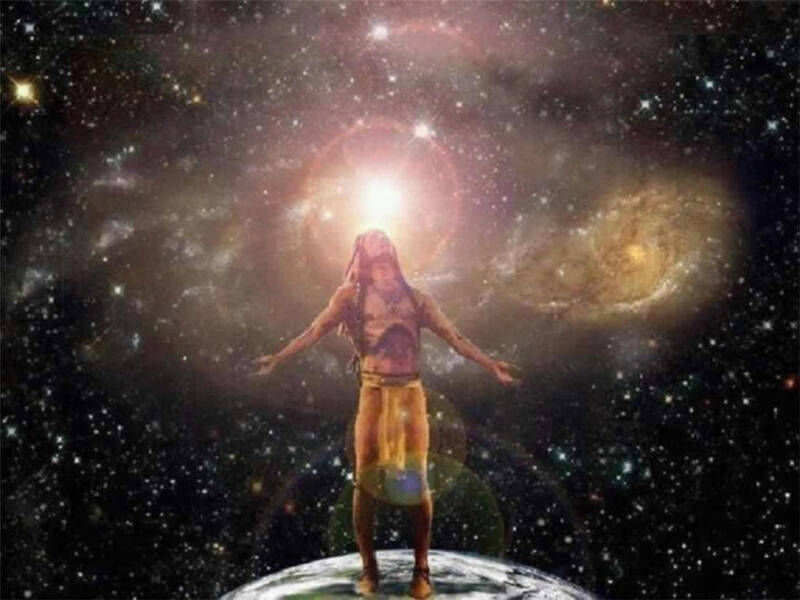 The hierarchy suggested by Sitchin, where the Anunnaki stood as the "common gods", the Nephilim as the "creators", and the humans as the "creatures" born/created on earth, finds similarities in the Native American lore.